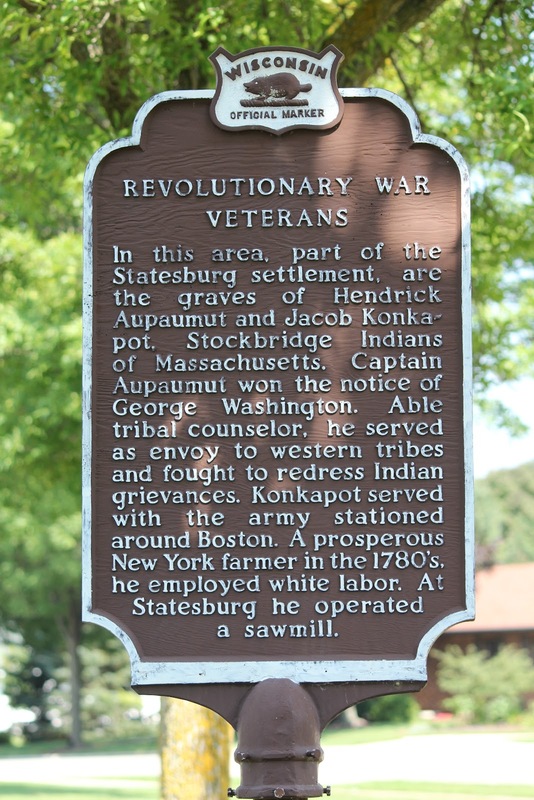 In this area, part of the Statesburg settlement, are the graves of Hendrick Aupaumut and Jacob Konkapot, Stockbridge Indians of Massachusetts. Captain Aupaumut won the notice of George Washington. Able tribal counselor, he served as envoy to western tribes and fought to redress Indian grievances. Konkapot served with the army stationed around Boston. A prosperous New York farmer in the 1780's, he employed white labor. At Statesburg he operated a sawmill. *Present at the dedication were R. Richard Wagner, executive director, Wisconsin American Revolution Vicentennial Commission; Tina Williams of Milwaukee, a direct descendant of Konkapot; Robert La Plante, mayor of Kaukauna; and Mrs. Arvid (Beatrice) Miller, Stockbridge-Munsee tribal historian. 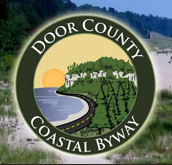 The marker is located in a residential neighborhood at Thelan Park, on Thelen Avenue, south of its intersection with West 13th Street, Kaukauna, Wisconsin 54130. 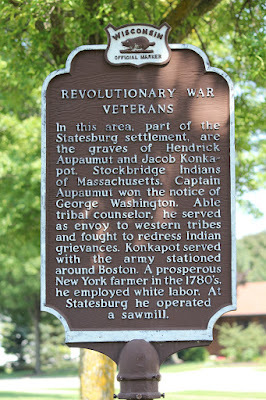 Jacob Konkapot was the grandson of Chief John Konkapot, a leader of the Stockbridge, Massachusetts colony. Jacob died in 1835 as a result of a sawmill-related accident. He was alone in the woods, felling timber, when he cut his leg with an ax. He severed an artery, and bled to death before help could arrive, according to Tanner's "History of the Streets of Kaukauna". 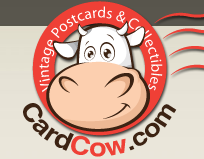 The years had worn heavily on Capt. Hendrick Aupaumut, who received his captain's sword from George Washington. Still at New Stockbridge in New York, the Captain felt the infirmities of age advancing and wished to see "his old friends and pass the last days among those he loved and for whom he had labored so strenuously all his life". His nation's affairs settled in the East, Aupaumut and his wife, Lydia Quinney, left New York for Statesburg (Kaukauna) in September 1827. He died in 1829 after a 2 1/2-year illness, which had left him nearly helpless. He was 72. His widow, a pious, courageous woman, died 10 years later. Neither Konkapot's nor Aupaumut's grave is discernable today. Like most of them in the old Indian cemetery near Kaukauna, Konkapot's and Aupaumut's graves have falled to the farmer's plow. Crops grow and are harvested where Stockbridge Indians -- Revolutionary War veterans and others -- were laid to rest long ago. The marker is located at Thelan Park, in a residential neighborhood. The marker is located in Kaukauna, Wisconsin.